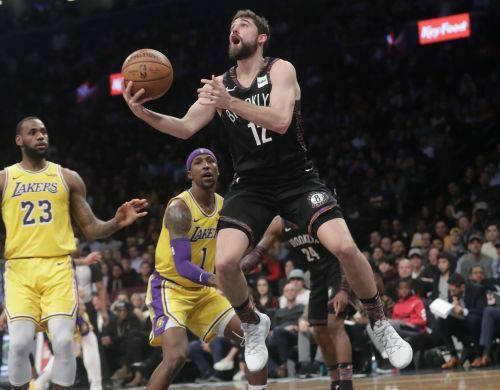 NEW YORK (AP) — D'Angelo Russell had 22 points and a career high-tying 13 assists against his former team, and the Brooklyn Nets ran the NBA's longest winning streak to six games by beating the Los Angeles Lakers 115-110 on Tuesday night. At 21-9, the Nuggets matched the 1976-77 squad for the best start through 30 games in the franchise's NBA history. They also remain on top of the Western Conference by percentage points over Golden State. This is rarefied air for the Nuggets: The last time they had played more than 25 games and were alone in first place in the conference was March 1977. Luka Doncic had a big game for Dallas with 23 points and a career-best 12 assists, while Harrison Barnes scored 30. The Mavericks hit 15 3-pointers against the NBA's top long-range defense. INDIANAPOLIS (AP) — Larry Nance Jr.'s buzzer-beating tip-in for Cleveland snapped Indiana's seven-game winning streak. Nance finished with 15 points and a career-high 16 rebounds in the Cavaliers' third road win of the season. Rodney Hood scored 17 to lead Cleveland (8-23). The Pacers (20-11) were led by Domantas Sabonis' 17 points, but they never took control long enough to pull away. Victor Oladipo missed two free throws with 9.5 seconds left, failing to extend Indiana's 91-90 lead. ATLANTA (AP) — Jeremy Lin scored 12 of his 16 points in the final period and Atlanta overcame Bradley Beal's 29 points for Washington. Lin's big fourth quarter included a dribble fake that sent Thomas Satoransky falling backward, leaving Lin open for a jumper and a 103-93 lead. Lin added a layup on Atlanta's next possession.